Here is your Angel Card Reading & Channeled Message for the next week, friends. 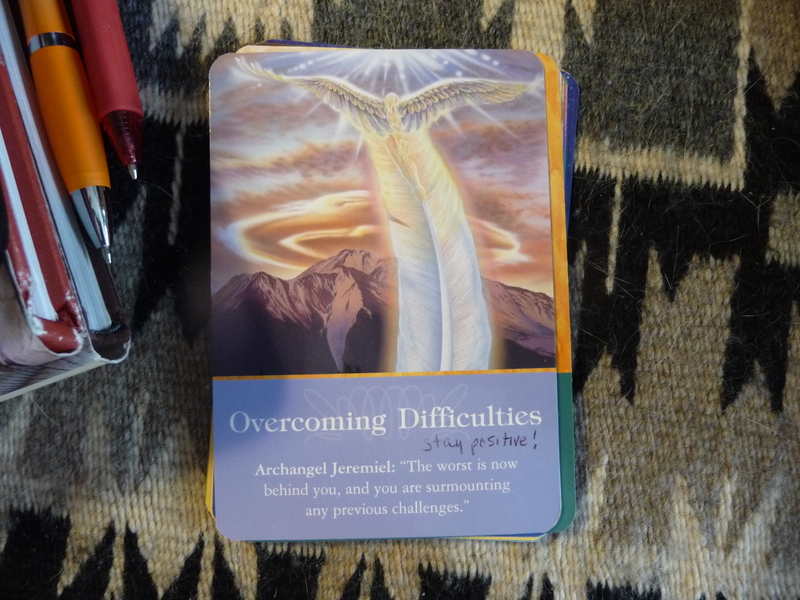 For today’s reading they took me right to the always wonderful Archangel Oracle Cards by Doreen Virtue (while these cards are no longer in print, I did check on amazon and they are still available there). This is a card of hope and encouragement. Even if you don’t see the shift yet, when this card comes the angels are saying STAY POSITIVE. When this card comes, the angels are asking that you move out of feeling like a victim, remember that you are a spirit in human form and that all is in right order as it is unfolding, and that you take the lesson learned, and then let the rest of the situation go and move ahead. Even if you don’t see the shift yet, stay positive, and open to receive the new that is, or will soon be, unfolding before you. You are so loved, say the angels. Please remember to keep talking to us, they say. We are right here for you — you just need to ask and in we’ll come, they say. Don’t be bashful, they say. Talk to us, dearest ones, they say. We love you, and we are here for you. p.s. — please share this email with anyone else who might find these readings of interest, thanks!